This year, Insomniac’s VIP program will offer Headliners a host of interactive activities and special anniversary offerings across four breathtaking stages. Each dynamic word to describe the unique experiences VIP has in store is an invitation to enhance the unforgettable three-day adventure that is EDC Las Vegas. VIP Headliners will explore three elevated viewing decks at kineticFIELD, cosmicMEADOW and circuitGROUNDS—in addition to a private VIP Dance Area and Lounge with cooling misters at neonGARDEN. Experience the true meaning behind EDC and brighten someone’s day with the Random Act of Kindness Booth inside circuitGROUNDS. The pop-up Throwback ‘90s Warehouse Party at kineticFIELD offers an authentic celebration to honor where it all began 20 years ago. Make your mark on EDC with other Headliners at the EDC Memory Wall, located inside the kineticFIELD VIP courtyard. Indulge in delicious craft cocktails and gastropub fare inside the Blind Owl Speakeasy while watching the show at kineticFIELD. Add a splash of color to your EDC fashion at the Body Paint & Beauty Bar, located inside the kineticFIELD courtyard. Sit back, relax and take a breath of fresh air at the VIP Oxygen Bar inside the kineticFIELD courtyard. Nightly Scavenger Hunts will have VIP Headliners exploring every inch of the festival grounds to win unique prizes. Snap a creative shot at EDC Las Vegas, and enter nightly Instagram challenges to win more exclusive prizes. Forget your kandi at home? No problem! Make friends while you accessorize at the VIP kandi bracelet-making station, located inside the kineticFIELD VIP courtyard. Embrace your inner child and jump, dive and play in the VIP Ball Pit at kineticFIELD. Challenge other VIP-goers with life-size Jenga, pool tables, ping-pong and arcade games at neonGARDEN. At all four VIP areas, create memories in the Interactive Photo Booths, with instant downloads right to your phone for easy sharing. Chill out and grab a cone at the Shaved Ice Stand located inside the circuitGROUNDS courtyard. Stay hydrated and beat the lines inside the festival at the VIP Water Refill Station at kineticFIELD. Kick your energy up a notch with a caffeine boost at the Coffee Bar located at circuitGROUNDS. Cleanse your body and load up on essential nutrients at the Fresh Juice Bar and food truck at neonGARDEN. Why wait? Get the party started faster with dedicated VIP entrances into the festival. Never miss an artist you want to see with a special VIP Festival Lanyard and schedule booklet. Take in the spectacular 360-degree views from the top of the VIP Ferris Wheel inside the kineticFIELD courtyard. Take advantage of the private, air-conditioned bathrooms to refresh and look your best before heading back out to the festival. Replenish with full cash bars and gourmet food options, fully equipped with EDC-themed cocktails located throughout each VIP area. Stay connected with VIP cell phone charging stations. Purchase custom EDC merchandise at the VIP Merch Booth located inside kineticFIELD. Relax, refresh and rehydrate with daybeds and chill zones located throughout all four VIP areas. Early VIP arrivals from 6–8pm have the opportunity to win special giveaways each night. More surprises for VIP Headliners will be announced in the coming weeks. 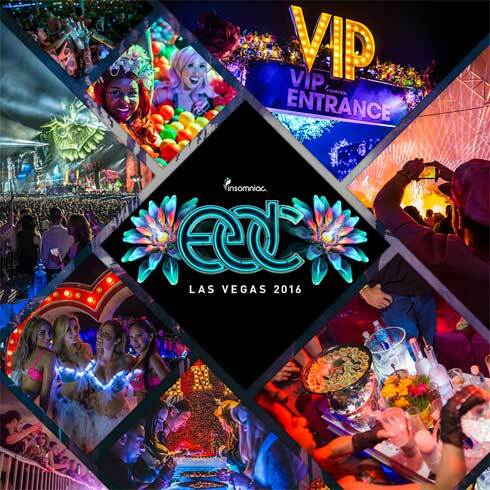 A limited number of tickets for EDC Las Vegas 2016 are on sale. For the most updated details regarding EDC Las Vegas, please visit LasVegas.ElectricDaisyCarnival.com.